The species is native to forest edges in the northeastern US from Minnesota to Maine and south to the mid-Atlantic states. Although it is a fairly adaptable species it is best sited in our region with some afternoon shade, some protection from wind, and with consistent moisture. Pagoda dogwood is known for its pagoda-like horizontally layered branching habit. It is also unique in that its leaves are arranged alternately along the stem, thus its other common name, “alternate-leaf” dogwood. 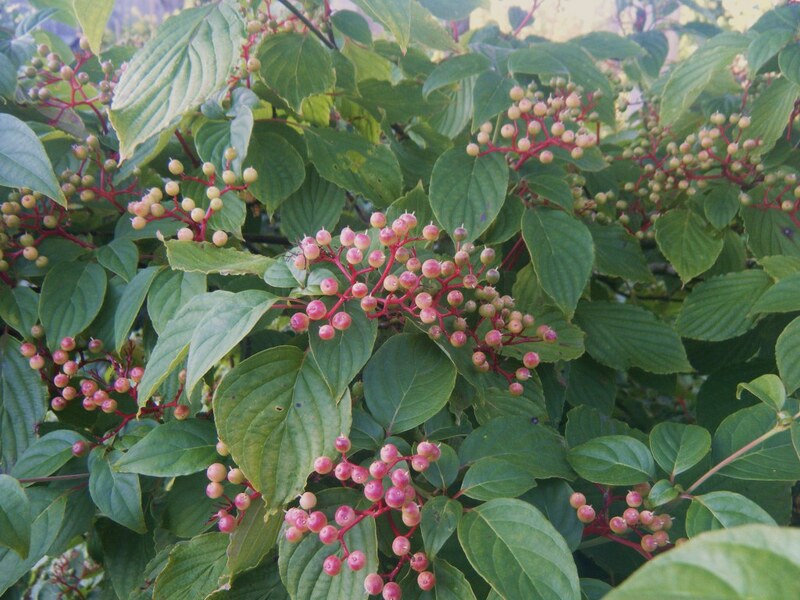 It is also unique in that its leaves are arranged alternately along the stem, thus its other common name, “alternate-leaf” dogwood. The white flowers of this species are borne in loose clusters 3-5” round and held slightly above the foliage. The ¼” fruits ripen from red to dark purple and are favored by many birds. This tree should not be grown in the western half of Nebraska.